MyJustice, an access to justice programme, aims to equip the people of Myanmar with knowledge, confidence and opportunities so that they can resolve conflicts fairly, equitably and justly. We work closely with local communities to achieve a lasting impact on the way disputes are resolved and justice is delivered, especially for poor, vulnerable and marginalised people. Overall objective: Improve access to justice and legal aid for the poor and vulnerable, develop legal capacity of justice sector professionals and strengthen selected rule of law institutions to better fulfil their mandates. Community driven: MyJustice works with its partner organizations to empower communities so that they are equal partners in the process of identifying solutions to the challenges they face. Powered by evidence: MyJustice gathers evidence from the process of delivering the programme to understand what works and what doesn't in access to justice programming in Myanmar. This evidence will be a significant contribution to the knowledge base on how justice is accessed and experienced in the unique socio-cultural and political context of Myanmar. Community members understand justice and their rights better. 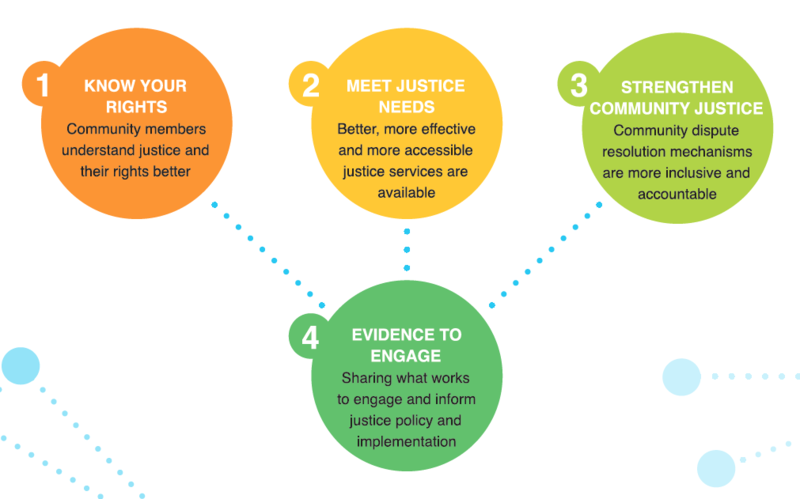 Better, more effective and more accessible justice services are available. Community dispute resolution mechanisms are more inclusieve and accountable. Sharing what works to engage and inform justice policy and implementation.